I know you'll be most excited to see what I picked up this week in Priceline's famous 40% off cosmetics sale. I KNOW. WHAT'S WRONG WITH ME??? Am I ill? Well, since you ask, I have had a little bug this week and it's been really hot and my energy levels have been low. But honestly, I didn't have any genuine needs or even any strong wants from the drugstore range. I have a couple of small staples on order from Mecca and am adding things to my Sephora wishlist as they become available but waiting until after Christmas for budgetary reasons. Could this mean I am curbing my shopaholic tendencies and not just buying for the sake of a sale?? Or am I leaning more towards quality over quantity? That won't stop me living vicariously through other people's haul posts, although I bet I spot something that will make me regret my non-attendance at the sale. Still, there's only so many products you can put on your face at once, right? RIGHT?? Has anyone had any luck restoring pressed powder items to their former glory with rubbing alcohol and dry time? Any other restorative measures you can recommend? I know from experience that when you're on the SAHM bread line, luxury items from your former flushed-with-disposable-income life are precious so any help would be welcomed. I had this happen to me with my Clinique All Over Bloom blush in Almond Blossom a few years ago. 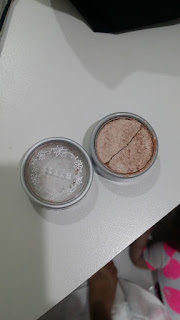 I had hit pan so I thought I would just get enother one - unfortunately they had since discontinued the colour! Boo! How about you? Did you score big at Priceline this week or are you shopping your stash or minimising like Christina at Jacaranda Skies (formerly of Love That Lippie)?